CROWN HEIGHTS — This one's definitely not kosher. 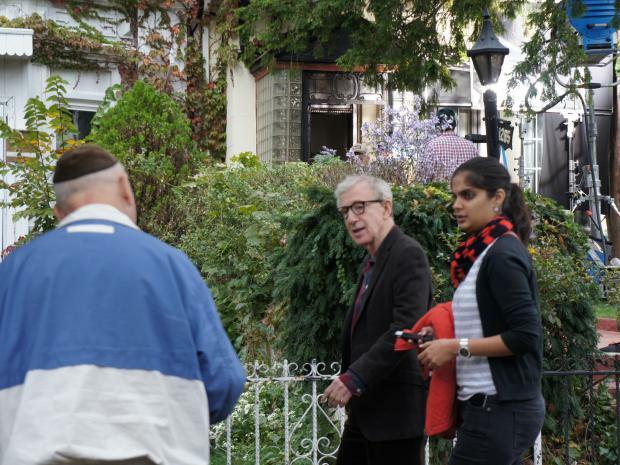 Few people in Crown Heights' Hasidic enclave are likely to see John Turturro's forthcoming feature "Fading Gigolo," but that didn't stop neighbors from trying to sneak a peek at the actor/director and his megawatt star Woody Allen during a film-shoot on President Street Wednesday. According to the Hollywood Reporter, the film will star Turturro, who was born in Brooklyn and raised in Rosedale, Queens, as an aging male prostitute and Allen as his pimp. French actress Vanessa Paradis will play an Orthodox widow. Insiders tell DNAinfo New York that the city's native-born sons fell in love with the house on President Street after scouting several others in search of a "particularly Jewish-looking home," but crew have been careful to shield the community from the precise nature of the film, calling it simply an untitled John Turturro project. Most movie buffs might ask their favorite star for an autograph or a picture, but when local rabbi Chaim and his pal Yossi stopped by to check out the shoot, they had a very different plan in mind. "We heard there's two Jews filming, and we want them to put on tefillin," said Chaim, who declined to give his last name, referring to the ritual objects observant men wear during morning prayer. "I'm not going to see it."